The End of Living | The End of Life. | Peter M. Schloss | J.D. - Mediator. The End of Living, The End of Life. The end of living and the end of life are not the same. This last week I enjoyed an afternoon with my father-in-law, Bill Nichols at a St. Patrick’s Day “Happy Hour” and music event hosted at his assisted living community. Bill is closing in on his 101st birthday. As one might expect, his abilities are a shadow of those he held as a younger man. For him and his fellow residents, physical beauty and vitality fled them years ago. However, beauty may yet be found within the eyes that reflect the youthfulness of their spirits. Bill was animated, sang, clapped, enjoyed a glass of wine, shared embraces with the musician and staff, and of course wore a ridiculous Irish themed party hat. I found his joy to be infectious. Actually, this one afternoon was not really exceptional. 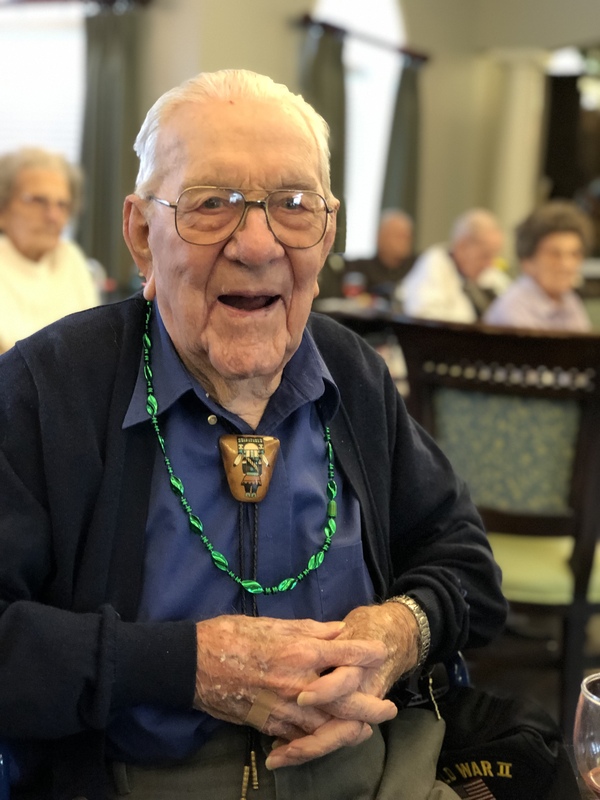 Bill’s days are filled with activities such as “Chair exercises”, Bingo, “Balloon Volleyball”, and group sing-a-longs, not to mention the social exchanges that occur with his fellow residents at meals and throughout the day. Bill’s days are a joy that serves as an analgesic to the ills of his advanced years. Being around Bill has left me to reflect upon the contrast of my visits with my father during the final years of his life. Dad died in 2009, 87 years old. He had suffered the intensifying effects of Multiple Sclerosis for over 30 years yet in his final years his abilities and challenges were not very different than those imposed upon Bill Nichols by virtue of his advanced years. Dad’s last years were in a nursing home community. I could usually find my father alone within his darkened room, shades drawn, television off, a faint antiseptic odor in the air. My father’s view of life in his final years may best be summed up by his own words. I would open visits with him by asking, “How are you Dad?”, and he would invariably respond from his bed, “Just waiting…”. Sadly, there was never any question what he was “just waiting” for. As Christine and I entered our 60’s we have been continuously bombarded with ads, solicitations, and messages encouraging us to prepare for the end of life. Have we secured our final resting places? Living Trusts? Explore the benefits of Insurance Annuities! Beneficiary Designations in place? What about Charitable Giving? There is little about continuing to live and much about the end of life. My father’s life ended in his 87th year, but I believe that 30 years earlier he retired from living at the same time that he retired from work. Dad had been a college coach, Director of Athletics, and a teacher. He was highly regarded in those roles; they were his passions. When he retired a cavernous vacuum formed in his life. Dad never sought other interests that might have carry the joy of living into the years beyond his working life. Another contrast: My mother will be 94 this year. She is as busy today as she was 40 years ago. She has her Bridge Club, Woman’s Club, Church activities and myriad other social and community engagements. I see in her eyes the same joie de vivre that I see in Bill Nichols. There is a lesson in these observations: We have more influence and control over delaying the end of living than we have on the end of life. When age or infirmity deny us the pursuit of one passion, find another to replace it… Always have a next thing and Pursue Good Stuff!!! PS. Dad, my calendar just reminded me that tomorrow is your birthday and you would have turned 97. Although you have been gone 10 years it seems that I am still learning from you. Pete, I love this story, which I will share with my 92 year old Mother. She has some of the same traits as your Mom. My Dad, who died at 76, shared a few of your Dad’s traits. On my parents first visit to our Florida home, a year before he got sick and died, he told me, ” I have lived a good life and have done everything I wanted to do.” I told him to not get any ideas and check out, you have 150 Florida golf courses to play! Thanks for sharing! Thank you Deena. I am happy for you and your mother that you can still share each other’s company. Tell her hello from me! Thanks, I treasure each visit and phone call with her! She lives close to my youngest brother, Mark Brenham, Texas, a 1.5 day drive for us. I am her only daughter, and Mom’s also an Artist! Very special! I totally agree, Pete. My mom’s motto was, “,busy hands are happy hands!” As age and infirmities took away her vision to sew, quilt, ceramics, etc., and her family moved away and she didn’t want to leave her lifetime environs, her friends and kin passed away, she felt like she lost purpose, and with it, her will to live. I pray I can mush on for many years! Babe, I just can’t imagine you ever sitting still! Looking forward to ponies and fishing and passing along the many antiquated interests that pique my mind! Thank you, Pete. This is a good reminder that we get out of life what we put into living! Pete, I always found you to be a wonderful mediator, but I think you’re an even better writer. Congratulations on making every subject you direct your attention to so enjoyable and relatable! Wow Stewart! I am so grateful for your comments and recognition. Be well friend. Liz, you are so right. Joy, laughter, love, wonder… all spring from the child within. Because of my infected finger, it is hard for me to type. I have Paul’s help. Loved your essay. You are very perceptive, as always. Love you and your words. Thank you for sharing. Your father reminds me of my own. I always said he died the day my mom passed away but he was just still here. His last days were spent in a nursing home where the only person he would talk to was me. We never know when our own lives will come to an end and it’s a bright spot to hear about your father-in-law and also the way you and Christine enjoy life. We could all take a lesson for your both. Happy travelers. Your Mom taught you well! We do seem to be facing these questions & issues frequently as we face our own retirement & Taking care of our aging parents. Your words & actions keep me hopeful & not “just waiting”. Mary, if we “just wait” long enough it’ll be our children having this discussion about us!